Assistant Professor Sigrid Close won the Hellman Fellowship to pursue her research on the electromagnetic effects of hypervelocity impacts (Credits: Hellman fellows Program). Why do satellites fail? Although it may seem like a simple question, the answer is sometimes elusive. When a spacecraft like the European Space Agency’s Olympus communication satellite in 1993 or the Japan Aerospace Exploration Agency’s Midori II in 2002 just stops working, it has not always been possible to determine exactly what went wrong. Micrometeoroid impacts, space debris collisions, and radiation-induced electronics hangs up can usually be tracked down. But if none of these culprits fits the available data, satellite operators have had to mark it up to fickle fortune and eat the loss. These types of failures caught the attention of Stanford University researcher Sigrid Close. Close’s experiments have pointed to a potential culprit: space dust. Space dust, or cosmic dust, generally travelling in the range of 10-40 km/s, becomes plasma upon collision with an object. Larger particle collisions also generate plasma, but these collisions are much rarer and generally more detectable, so they are not good candidates to explain unexplained satellite failures. Close has found through ground experiments at the Max Planck Institute that plasma striking satellite-like bodies can emit electromagnetic pulses able to disrupt spacecraft electronics. 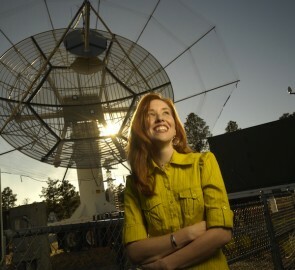 Close and her colleagues proved out the theory by firing 60 km/s dust particles at targets. “We found that when these particles hit, they create a plasma or quasi-neutral gas of ions and electrons, and that plasma can then emit in the radio frequency range,” Close said. Tellingly, these radio emissions did not always occur, being highly dependent on orientation and thermal variations of the “spacecraft” targets. This variation both explains why the cause of these failures has been so elusive and provides potential protection mechanisms to prevent such failures in future. “There are solutions we could implement to save billions and billions of dollars,” Close avers. Studying cosmic dust can be challenging, since it is very difficult to capture for study. NASA’s Stardust mission succeeded in capturing some particles of interplanetary dust, only to discover how challenging it is to find miniscule dust particles in an aerogel array. Stardust ended up enlisting thousands of volunteers to pore over thousands of three dimensional image stacks hunting for the elusive particles; they’re still looking, seven years later. Hopefully, Close’s simulated dust behaves sufficiently like the real thing to bypass the need for improved compositional and configurational veracity. Close will determine whether her model fits the bill with her upcoming in situ experiments outside the International Space Station. She is now working with NASA Jet Propulsion Laboratory scientists to prepare that hardware for deployment.